Free Flipped Learning Webinar from PBS Learning Media – I will be moderating an exciting free webinar at PBS Learning Media. Joining me will be Jon Bergmann, one of the Flipped Classroom experts and pioneers. I know you will enjoy his engaging presentation. He is an amazing facilitator and speaker. You can register for free at PBS Learning: Get Your Tech On. The date is Wednesday, October 16, at 4:00 PM EDT. You can also listen to a conversation between Jon and myself at the Flipside BAM Radio Network. Last, be sure to take a look at Jon Bergmann’s book co-authored with Aaron Sams entitled Flip Your Classroom. It is a must read for those considering or practicing the Flip. Also, take a moment to visit the Flipped Learning Network. Last, don’t forget to learn more about PBL at the BUCK Institute (BIE) where I am on the National Faculty. Now… let’s investigate PBL and Flipped connections. Read On! Have you ever considered flipping your classroom and engaging students in Project Based Learning at the same time? As I study these learning processes I see possibilities that allow the two to not only coexist, but also complement each other. How might this work? They do share similar emphasis on higher order thinking skills. Another not so obvious way the two can complement each other is based on productivity and time. Let’s take a closer look. As you might know Project Based Learning (PBL) is a dynamic process that allows students to learn and understand content at Bloom’s highest level while taking an active part in their learning. PBL provides for deep inquiry, which leads to rich and powerful understanding. Through authentic experiences, and a driving question that engages students with content standards, PBL has the ability to be a delivery method for the student centered classroom. In PBL, formative learning activities are scaffolded throughout the project. This allows for productivity between content delivery, facilitation, and student production. Let’s consider a way to allow for even more student productivity in PBL, which can exponentially spiral learning, How can this increased productivity for both teacher and learner take place? A flipped infusion just might be the answer. As you might already know the Flipped Classroom was first coined with the idea that class lectures are recorded and watched at home while the teacher assists students with homework in school. Technology makes this very basic scenario a real possibility. Through the years the Flipped Classroom concept has become more sophisticated with an increased benefit to the student. While lectures still may be ported for home use, teachers have found powerful ways to utilize class time beyond homework help. The Flipped Classroom has become more of a Flipped Learning experience. While instructional videos may be viewed at home, teachers are providing higher order learning activities at school to compliment the home learning experience. As we look at the process of PBL and Flipped Learning we can begin to see how the two together can promote Bloom’s higher order learning. Together they provide a streamlining of valuable time, which in turn allows for increased productivity. As we continue to examine this concept several other added benefits are accomplished. First, as teachers combine the PBL and Flipped experience, they see learning spiral. This allows teachers the opportunity to bring the home learning experience up a notch. Students are provided open ended questions, engaging interactive activities, and front loaded thought provoking videos at home that can spur classroom discussions and activities for the next class period. This blended experience erases the classroom walls allowing for an authentic and constant learning experience. Instructional videos, while still used at home, can also be incorporated as part of the PBL scaffold during class time. After-all, research has demonstrated that an instructional video can be more time productive than a live lecture. Plus, there is also the added benefit of the student able to pause, rewind, and replay the instruction. Try that in a lecture. Please note that the teacher is still available for face to face time in order to provide any reinforcement needed in the learning process. In this day of what appears to be numerous educational initiatives, it is exciting to see how two are able to work in harmony with each other. In fact, as we further reflect we just might see how other initiatives such as 21st century competencies (4 C’s), technology integration, digital curriculum and literacy, 1 to 1 computing, PBL, and Flipped Learning really do blend as one. In closing, we just may wish to ask, how many educational initiatives there really are? Perhaps there are not as many as we originally thought. 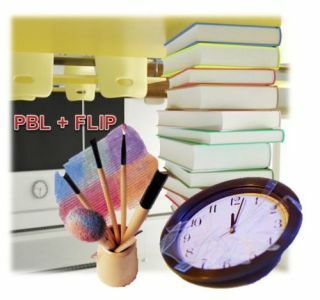 It maybe time for you to see how PBL and Flipped Learning really can work in productive harmony. After implementing these two practices, you may wish to work on student centered learning next. Or perhaps you will have already done it!